Turning a hot rolled bar gives it improved size, straightness, and concentricity together with freeing the product from decarburization, seams, and other surface imperfections. 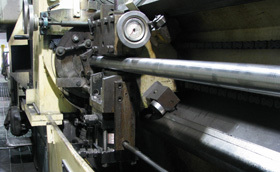 If you begin the turning process with a cold drawn bar you would achieve all these attributes in addition to increased strength levels and improved machinability depending upon the grade of steel being used. For more information about Corey Steel’s cold drawn turned & polished steel bars, please see Products > Turned & Polished. Rounds- Cold Drawn or Turned & Polished Max Carbon Range0.28% or less Max Carbon Range0.28% to 0.55% incl. Max Carbon Range0.28% or less Max Carbon Range0.28% to 0.55% incl.